The sinking of the US Battleship Maine in 1898 was a major watershed change in public opinion. Besides leading directly to war with Spain, the results of the war changed the future of the entire USA and the world. The U.S. Navy wanted to build public support to obtain more funds to build a larger fleet of ships. They came up with the idea of naming new battleships after various states. Cruisers and smaller ships were named after various cities. The scheme was pretty successful and fund raisers were held before the launching of a new ship. For some of the battleships, large servings of exquisite silver were made for use by the captain and officers. In addition, these elaborate silver services were used in a diplomatic manner when the ship was in a foreign port. The captain would invite local dignitaries on board and they were served banquets using the silver sets. The battleship Arizona had one of the most elaborate silver services. I saw this magnificent silver display in the capitol building in Phoenix. Much has been written about this service and there have been several articles in Silver Magazine. 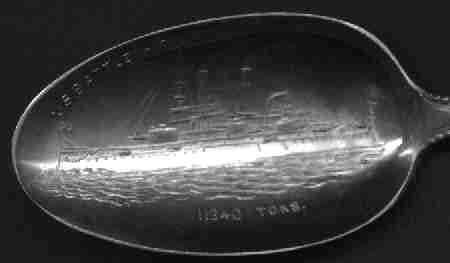 These spoons are all hand engraved with a picture of the ship. 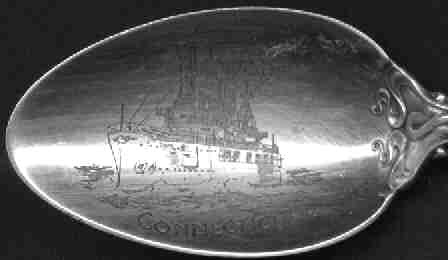 Acid etched bowl of the battleship "Connecticut"
These two spoons are from the Navy Shipyard at Mare Island, Vallejo, California. The top spoon has an unusual detailed standing bear finial and the gate to the shipyard is engraved in the bowl. (the back of the bear is also decorated with vines and grapes). The bottom spoon features a large poppy flower and an unusual rendition of the California state symbol. 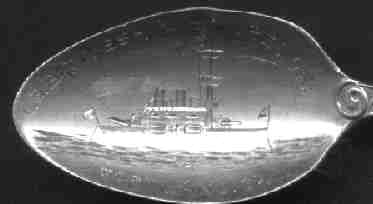 The bowl features an engraved picture of the "new dry dock". There is an interesting history of this shipyard available, but I haven't had time to write it up yet. So you will have to come back at a later date.